ARLINGTON, VIRGINIA–The National Science Foundation (NSF) is a federal agency charged by Congress “to promote the progress of science; to advance the national health, prosperity, and welfare; to secure the national defense…” It had a budget last year of $6.9 billion and is a major source of funding for American scientific research, especially in colleges and universities. NSF is highly respected — and not a little feared — by working scientists. I visited NSF headquarters in Arlington, Virginia, for a meeting with Lisa Park Boush (Wooster ’88) who is a Program Director for Sedimentary Geology and Paleobiology. Although we were not discussing NSF business (we were transferring the Secretary position of The Paleontological Society from her to me), I learned a lot about the agency from Lisa. NSF officials work very hard, for one, and they are very concerned about the scientific communities they serve. 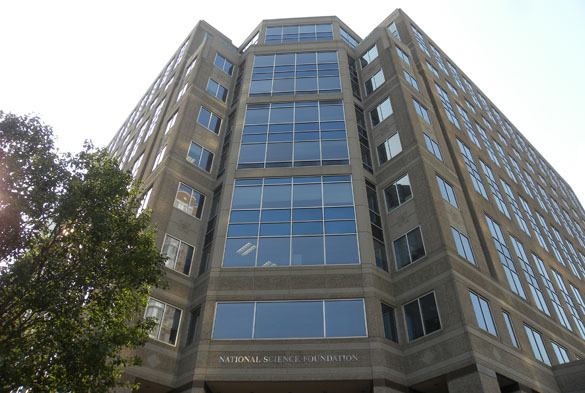 The impressive front of the NSF building in Arlington, Virginia. 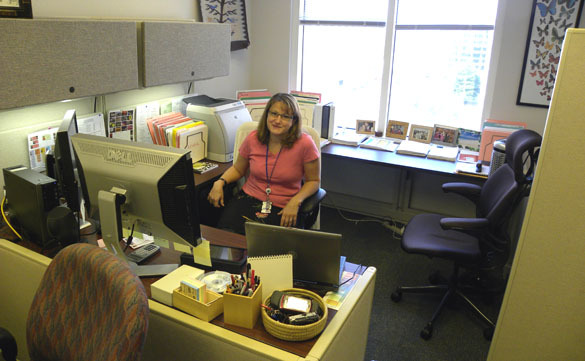 Lisa Park Boush in her NSF office (with a coveted window view behind her). Lisa was one of my Independent Study students, so I am especially proud of her accomplishments and responsibilities.